- More than 50 videos showing Jan modeling key parts of guided reading lessons for every stage. Jan Richardson, PhD, is an educational consultant based in Wisconsin who has trained thousands of teachers and provided classroom demonstrations on guided reading. 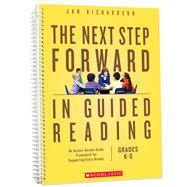 Dr. Richardson is the best-selling author of The Next Step in Guided Reading (Scholastic) and coauthor of Next Step Guided Reading Assessment (Scholastic). A former teacher, she has taught in every grade, K12. She has been a reading specialist, a Reading Recovery teacher leader, and a staff developer.